The next great basketball shoe from the people who brought you the last great basketball shoe. And the one before that. And the one before that. 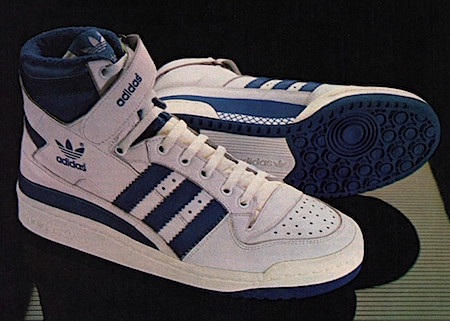 And now adidas brings you The Forum. Feature for feature, it’s the shoe of the 80’s. For shock absorption, The Forum is the only basketball shoe with our unique ‘Dellinger Web’. The exclusive adidas Dellinger Web. This system of nylon netting softens the force of impact on the foot by dispersing it over the entire sole. Also, there’s the ‘impact-absorber inlay sole’ which comes with a ‘built-in rubber heel cup’ for additional protection. The Forum also offers several features designed to give every player greater stability. Our new ‘criss-cross system’ of adjustable leather straps helps keep the ankle from moving sideways to prevent injury. To give you better balance and additional motion control, we have added the firm rubber ‘stabilo heel counter’ and wide ‘power-track sole’. For greater mobility, The Forum has the adidas ‘ankle-hinge’ and improved ‘foreflex toe cut’. Often imitated, but never equaled, these patented features allow your foot to bend naturally. Even on fast breaks. And don’t think we forgot comfort. Inside you’ll find soft, ‘moisture-absorbant terry cloth lining’ and additional comfort cushioning. So move upcourt to the shoe of the 80’s. 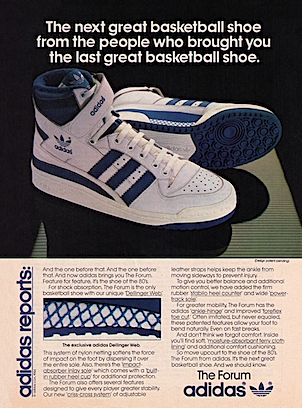 The Forum from adidas. It’s the next great basketball shoe. And we should know.